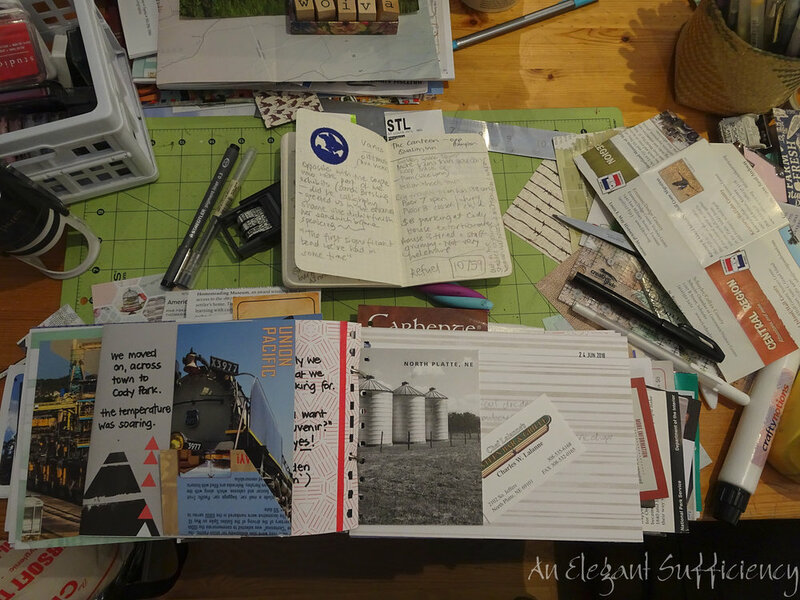 Though I seem to have been spending rather a lot of time sitting at my worktable, finishing my road trip journal seems to be a never ending task. I've got as far as Cheyenne this afternoon, so have not go so far to go. Noting it to be a Bank Holiday weekend though, on Friday I felt it was time we got out and about. When I first noted the exhibition, it had the whole summer to run and we had forever to pop along and see it - or so it seemed. Yet, here we were with September fast approaching and it was time we got our act together for sure. 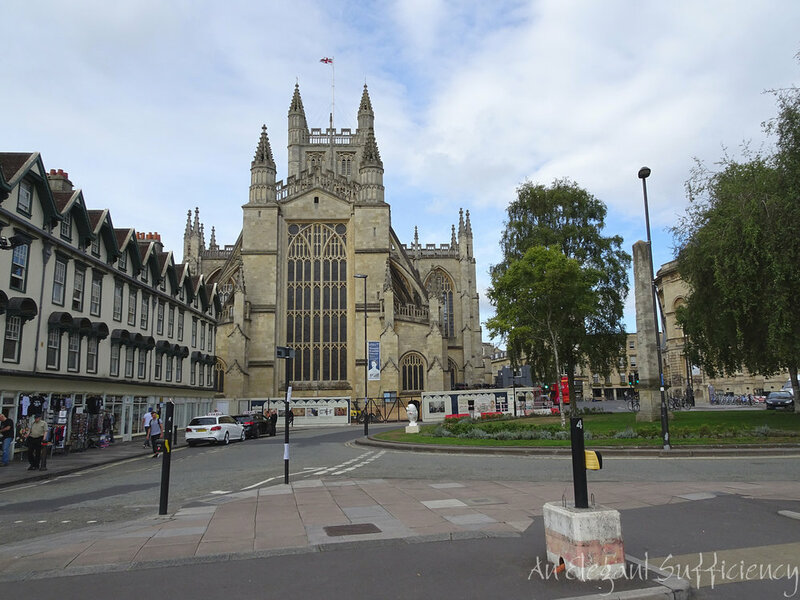 Bath isn't our favourite place to spend a summer's day but we go early, get the car parked in our favourite spot and head on into the city before the crowds. We steer clear of the tour groups where possible and stick to the places we need to go. We always grin as we pass the Roman Baths and often refer to Minerva somewhere around there. This morning, Minerva was more prominent than usual, for the owl has been chosen as the summer city trail and they are to be found all over the place. I can't say I was taken by the design, which seemed too cartoony for a classical city such as this - the Hares in Cirencester are way more classy, though to be fair, this particular owl was possibly not representative of her breed. If I haven't told you why Minerva has a particular resonance with us, then sometime when we are sitting enjoying a glass of something together, remind me and I'll share the tale. Anyway, we wandered around the shopping centre, eking out the time before the exhibition opened. I was surprised by this "wisteria" tunnel, one of several in this part of the city. 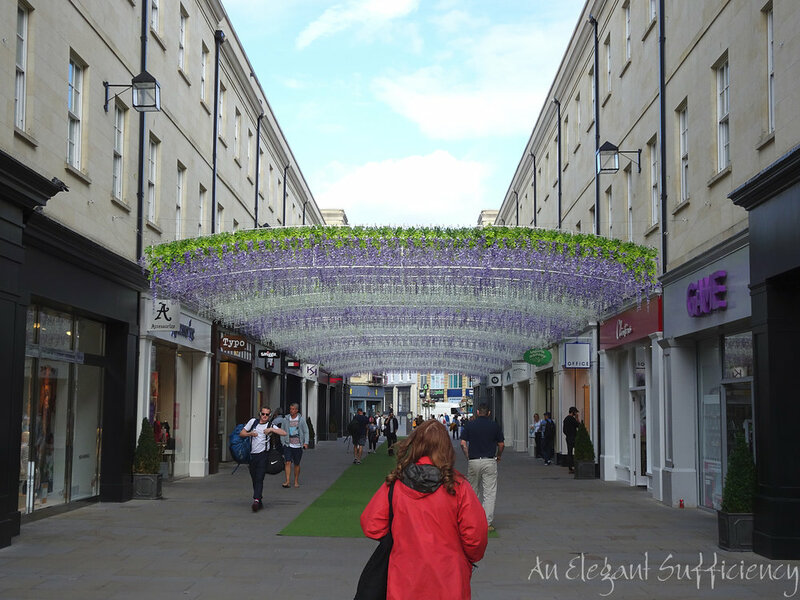 We wondered if it was meant to be purely decorative or if it had been part of some larger installation? I imagine that it provided a little shade during the recent hot weather, when the large expanse of stone must have created a furnace around here in the afternoon - there is little or no shade otherwise. 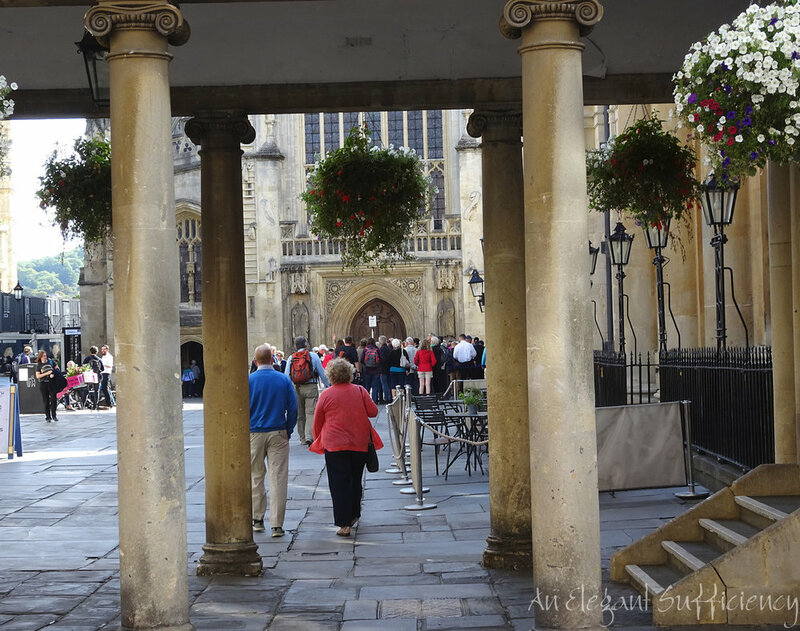 Continuing around to the other side of the Abbey, we were making our way towards Pulteney Bridge and the gallery, muttering as we went about the coachloads of people who were arriving every few minutes. The funny thing is, when I look at my photographs the city looks rather empty. I'm not sure how I did that! We admired The Empire Hotel as we walked towards it. It's always amused us, having a mixture of architectural styles up there on the roofline but it's only now as I looked up that link that I found out about them! We knew it had been used by the MoD until relatively recently, but other than that, didn't really know much about it at all. Around the side of the Hotel (I'm not sure if it was ever an hotel at all) we stopped and gazed over the weir towards Pulteney Bridge. The exhibition was at the gallery on the left hand corner of that junction and didn't open till 10.30am - we had oodles of time. So we hung around on the corner for a while, watching the people on the bridge. 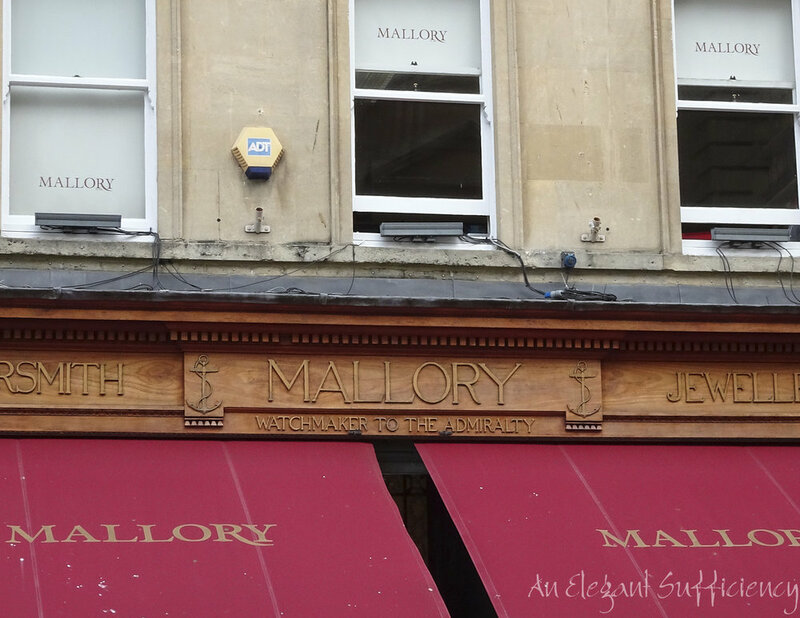 Spotting another reference to Bath's Naval associations on the jeweller's shop opposite. Eventually, it was opening time! Hurrah! No photographs inside, sadly, but if you're familiar with Kaffe Fassett's quilting, you'll have a good idea of how it was. My Hero was particularly taken with Candace Bahouth's mirror frames too - though we didn't stay long, we were both really glad we'd come. Whilst here, we thought we'd take a look at the permanent collection too, though a school holiday art workshop was going on at the same time, so it was...interesting! I liked Peter Blake's Daisy Fairy, though admit it did look rather better without that deep shadow I managed to capture in my photograph. 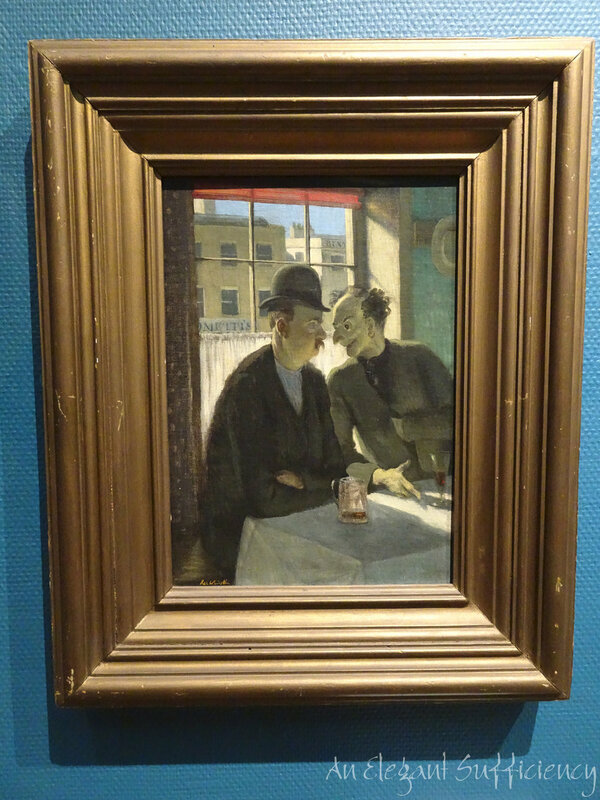 We both smiled at Rex Whistler's "The Foreign Bloke". When it came to choosing what to take home with me though, practicality would have got in the way, for the thing I most coveted was George Frampton's screen of St Elizabeth and St Dorothea. Do you think they'd miss it? Most amusing artwork beyond doubt was Grayson Perry's Map of Days, though. So clever, so thought provoking...we stood for quite some time looking at the small details, amusing ourselves with the juxtapositions and the little quirky inclusions. Somewhere in that list ought to be "National Treasure". All that remained to complete our jolly was a spot of lunch opposite the Theatre Royal.